High-usage backcourts were something I fooled around with earlier in the season, though the filters I made back then (usage rates: 25 percent, players had to start together) were so stiff I had to look at backcourts across nearly 20 seasons. That was sort of the point, but at the same time there weren’t as many really high-usage backcourts as I initially thought. This time I scaled back on the filters, making room for guards this season (74) that used higher than 20 percent of their team’s possessions. I also didn’t leave out players who didn’t start and instead fiddled with 2-man lineup stats from NBA.com featuring guards meeting both the 20 percent usage rate requirement and logging over 250 minutes together. In the end, 32 backcourt pairings made the cut. If I went by duos that each used up 25 percent of their team’s possessions, only the Dion Waiters/Kyrie Irving and Wroten/Carter-Williams duos make the list, though those tandems have rarely started games together. 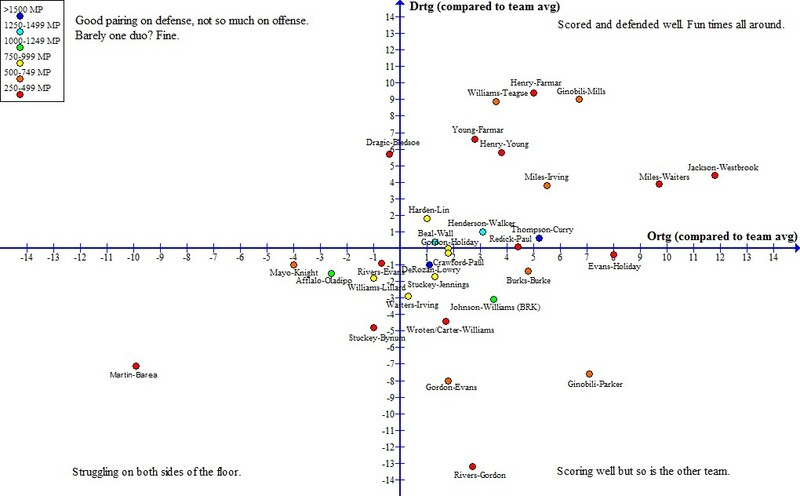 Below is a visualization of each duo’s efficiency while on the court compared to their team’s average. For example, Brooklyn has scored 3.5 more points per 100 possessions than their team average with Deron Williams and Joe Johnson playing together but they’ve allowed 3.1 more points on defense. I also added “BRK” next to that duo because of how common their last names are. Hopefully the others are self-explanatory. The color of each duo represents the range of minutes they fall in, located in the upper left. Klay Thompson and Stephen Curry have both logged more total minutes (1,904) and averaged more minutes per game (30.7) together than any other tandem, though DeMar DeRozan and Kyle Lowry are close behind (1,803 and 30.0, respectively). Duos that are in the bottom-half of the chart have their names below their dots and the opposite for those in the upper-half. It doesn’t seem too surprising that no combo is stifling on defense but bad on offense. Goran Dragic and Eric Bledsoe barely make that fourth of the graph with Suns lineups scoring 0.4 points less per 100 possessions with both of them on the court. If anything, lineups would normally be the other way around which is the case for 10 of the 25 pairings that score higher than their team’s average. It’s also not surprising that the combos that stray furthest from the average are the ones with the smallest sample sizes. The larger the minute total, the closer they should be to their team’s average. Minutes per game will be looked at further down in this post. The Thunder’s combo of Russell Westbrook and Reggie Jackson (+16.2) and the Spurs’ of Manu Ginobili and Patty Mills (+15.8) stand above the five pairings from the Cavs and Lakers as the best duos. The biggest disaster comes from Minnesota with Kevin Martin and J.J. Barea, logging 313 minutes together over 49 games for a net of -17 points/100 possessions, at least compared to their team’s overall efficiency. Over 100 of their minutes have come with Corey Brewer, Kevin Love, and either Dante Cunningham or Nikola Pekovic. The one with Cunningham gets killed on the glass and can’t take care of the ball, altogether allowing 133 points per 100 possessions while the unit with Pek has a net of -8.3 points. There are a couple Barea-Martin lineups that have yielded good results, though they’ve totaled only 20 minutes or so. Judging by the players filling out the rest of those positive lineups (Alexey Shved, Robbie Hummel, etc. ), they likely beat up an opposition’s second unit. Overall their sample size is one of the smallest. Not nearly as big of a struggle, though still pretty bad are the Gordon-Rivers and Evans-Gordon combos in New Orleans and the Rodney Stuckey-Will Bynum duo in Detroit. So the biggest upswings or downswings come from duos and their lineups with the smallest samples, but do they also log the least amount of minutes per game? Below are the same pairings with the color of their dots representing minutes per game instead of total minutes. As usual, click to enlarge if you’d like. Below is a GIF that might help look at combos that log the most minutes per game. There’s a slight difference in the combos that are negatives on both sides of the floor, but probably the most noticeable change comes where other pairings score a few points more. Most play a good chunk of minutes per game. Dragic and Bledsoe fit into that category and would log hundreds of more minutes if not for the latter guard being sidelined with a right knee injury. This all isn’t to say these combos are the only reason for the collective success or failure of their lineups. Maybe they compliment each other or the rest of the lineup well (or not, in terms of negative duos), benefit from playing alongside a star forward or center (or not), or beat up a second unit as opposed to starters (or…not..). As noted before, some sample sizes are smaller than others. Some of the duos, though, just look like they’ll give up more points than they generate over the long haul, like Tony Wroten and Michael Carter-Williams not exactly being a pairing that will stretch the defense. Others like Dragic and Bledsoe look like they’ll cause chaos no matter who they play. All stats are according to NBA.com unless noted otherwise.